Vashant Panchami is the festival, that indicates beginning of spring. One can find, many songs, poems, articles, essays on spring. This festival is also dedicated to MAA Sarswati. 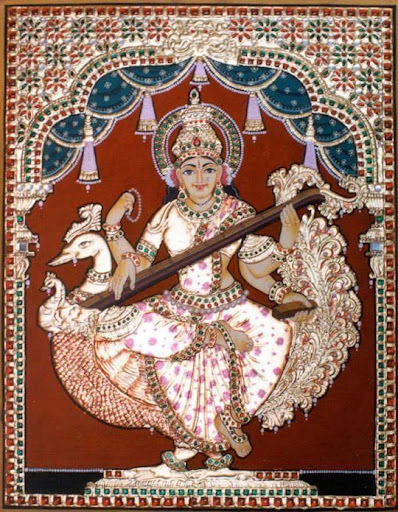 The goddess Saraswati is known as a goddess of knowledge, arts and music. Today, Saraswati Puja is organized at many places in India. We all know, knowledge is power. Today bangalore is IT hub due to software knowledge of all the youngsters of India. I believe I have grace of MAA Sarswati. So today's blog is dedicated to the goddess. I have a collection of MAA Sharada's photograph. Let me share them with all the readers of this blog. "Express YourSelf !". Click here. You can also contribute to this collection.